CVD accounts for approximately 33% of deaths in the United States. Diabetes (DM), hypertension (HTN), and dyslipidemia are major risk factors for CVD. Prediabetes is a risk factor for the development of both DM and CVD. However, data are limited to support the use of pharmacologic therapy in prediabetes. Among participants of the ORIGIN study (at high risk for CVD, with prediabetes or newly diagnosed DM), glargine delayed onset of DM, but did not confer lower risk of CVD events. Two meta-analyses which examined trials with sulfonylureas and metformin also did not support the use of pharmacotherapies among those with prediabetics. Among patients with newly diagnosed DM, the SAVOR-TIMI 53 trial observed a lower risk for CVD events at 2 years with saxagliptin. The UKPDS study noted a reduction in DM-related complications with intensive control (mean achieved hemoglobin A1c [HgA1c] 7%) compared with conventional care (mean achieved HgA1c 7.9%); however, no difference was noted in CVD event rates. At 10 years, a significant and lower rate of myocardial infarctions (MIs) was observed for the intensive group compared with usual care. A similar pattern was observed with type 1 diabetics in the DCC/EDIC trial, with a reduction in CVD events at 17-year follow-up in the intensive group (mean HgA1c 7%) compared with the control group (mean HgA1c 9%). In both studies, during follow-up, HgA1c levels were similar between the intensively treated groups and the control groups. Trials that included participants who had DM for a longer duration at time of enrollment included ADVANCE, VADT, and ACCORD. The ADVANCE trial demonstrated a lower rate of microvascular events with intensive control, but not for CVD events. In the VADT trial, secondary analyses observed benefit with intensive control only for those with DM duration <12 years and for patients with coronary artery calcium <100. No change in CVD or all-cause mortality was observed. The ACCORD trial observed an increase in mortality among participants randomized to intensive control; however, a significant reduction in nonfatal MIs was noted at 3 years for the intensive group compared with the control group. The 2013 American Heart Association/American College of Cardiology (AHA/ACC) cholesterol guidelines departed significantly from the paradigm of treating to a target low-density lipoprotein cholesterol (LDL-C) and instead shifted treatment towards differentiating between primary versus secondary CVD, and the overall risk of developing CVD. Based on data from the CARDIA trial and the Cardiovascular Risk in Young Finns study, lifestyle modification which includes a healthy dietary pattern and regular exercise should be implemented during childhood. Among low-risk groups, several studies suggest that statin therapy reduces the risk for CVD events. The JUPITER trial included men ≥50 years and women ≥60 years with LDL-Cs under 130 mg/dl and C-reactive proteins (CRPs) of ≥2. The HOPE-3 trial also observed reduced risk for CVD events among those randomized to statin therapy, among participants (men ≥55 years and women ≥65 years) with additional risk factors (elevated waist circumference, low HDL-C, current or recent smoking, evaluated glucose, or a family history of premature coronary artery disease [CAD]). Current guidelines recommend decreasing statin therapy if LDL-C is <40 mg/dl (after two readings). However, PCSK9 inhibitor trials have not observed safety concerns with LDL levels under 25 mg/dl. Current guidelines recommend pharmacotherapy for BPs of 140/90 mm Hg. This is an increase in the target for medication initiation for patients with DM, cerebrovascular disease and chronic kidney disease, and CAD (prior BP levels were 130/80 mm Hg). In addition, the goal was moved upward for those ages ≥60 years (from 140/90 mm Hg to 150/90 mm Hg). New guidelines will be published in November 2017. Among patients with high normal BP, two studies (PHARAO and TROPHY) observed delayed onset of HTN among those randomized to antihypertensive therapy when SBP was >130 mm Hg. In the HOPE-3 trial, there was no difference in endpoints among those randomized to a combination of candesartan and hydrochlorothiazide or placebo. However, among those with a baseline systolic BP of ≥143 mm Hg, a benefit was observed. The HOPE-3 trial also observed increased symptoms of hypotension among the intervention group. These data suggest that lifestyle modification is important for prevention of HTN. Targets for BP control remain controversial. Concerns regarding increased risk with lower BP (i.e., a J-curve) arose from studies predominantly in participants with existing CVD. The HOT trial observed no increased risk related to lower diastolic BP. No difference in CVD events was noted in the ACCORD trial, which randomized participants to intensive therapy with a BP target of <120 mm Hg versus standard therapy with a BP target of <140 mm Hg. Of note at 1 year, the mean systolic BP was 119.3 mm Hg in the intensive group and 133.5 mm Hg in the control group. It should be noted that the study may have been underpowered, given that the event rate was much lower than expected. Recently, the SPRINT trial demonstrated a benefit to intensive BP control (goal systolic BP <120 mm Hg) with a 25% risk reduction among the intensively treated group compared with the standard control group. The primary outcomes showed a reduction in heart failure and CVD deaths, with no significant differences in MIs or stroke between the two groups. The intensively treated group did have more symptomatic hypotension. Symptoms have been associated with an increased likelihood of patients discontinuing antihypertensive medications. The balance of intensive control should be weighed by the need for adherence to such medications. Prevention of CVD risk factors is critical, yet often resource intensive. Primary CVD prevention for patients with DM and HTN should always include lifestyle modification. 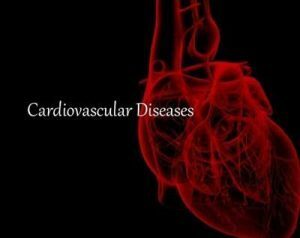 Aggressive glucose control should be considered for DM patients without evidence of CVD and in particular those without evidence of microvascular disease. Among those without CVD or DM, antihypertensive therapy should be initiated for systolic BP of ≥140 mm Hg with a target of <130 mm Hg. In contrast, the initiation of statin therapy for those at intermediate risk of CVD is not associated with adverse events and is associated with benefit even among those without elevated lipids. Further refinement of risk calculators may allow for improved identification of younger individuals who would benefit from early initiation of statin therapy. Great article, all must read.